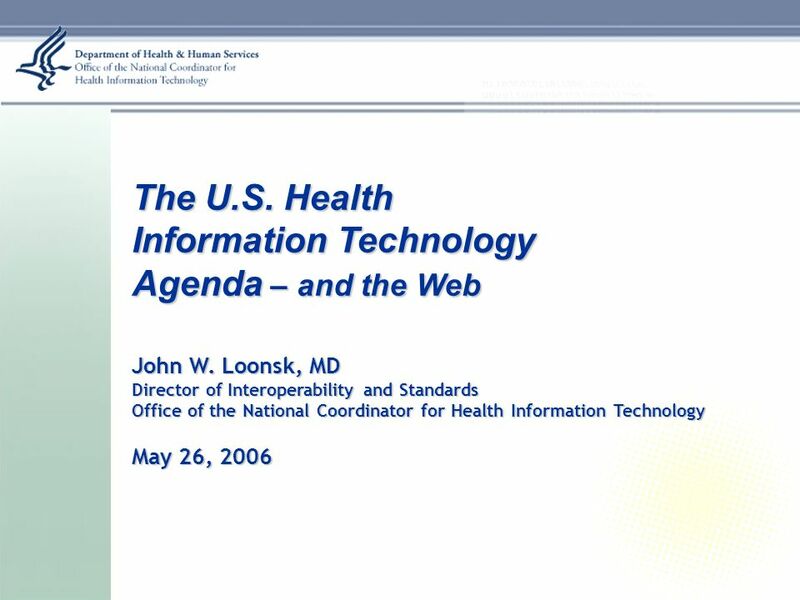 The U.S. Health Information Technology Agenda – and the Web John W. Loonsk, MD Director of Interoperability and Standards Office of the National Coordinator. 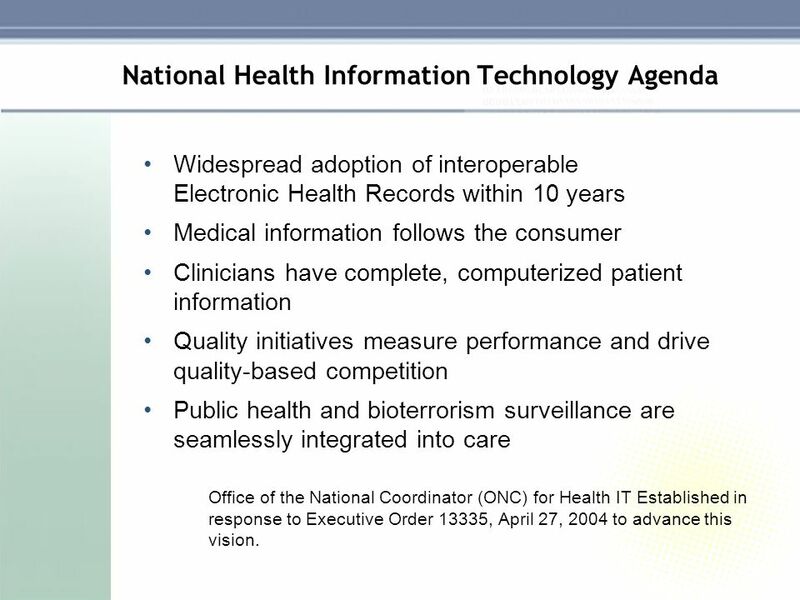 5 National Health Information Technology Agenda Widespread adoption of interoperable Electronic Health Records within 10 years Medical information follows the consumer Clinicians have complete, computerized patient information Quality initiatives measure performance and drive quality-based competition Public health and bioterrorism surveillance are seamlessly integrated into care Office of the National Coordinator (ONC) for Health IT Established in response to Executive Order 13335, April 27, 2004 to advance this vision. 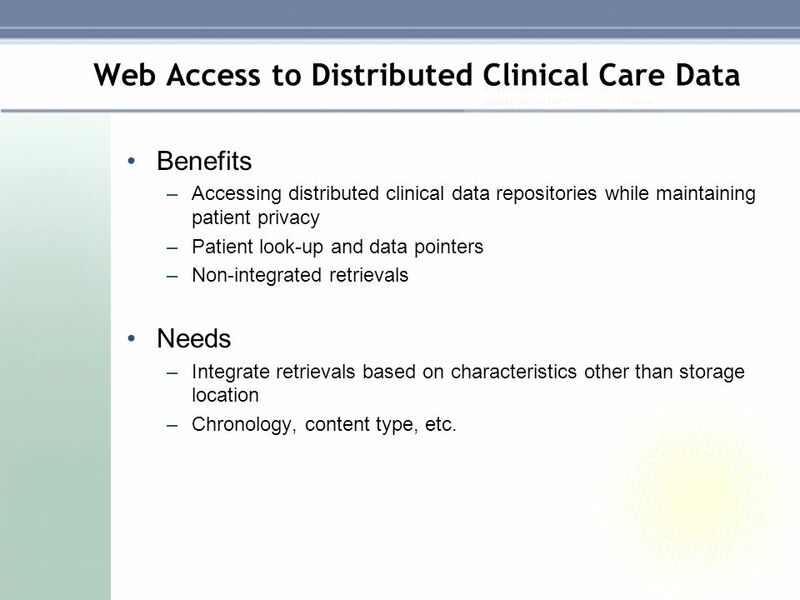 8 Web Access to Distributed Clinical Care Data Benefits –Accessing distributed clinical data repositories while maintaining patient privacy –Patient look-up and data pointers –Non-integrated retrievals Needs –Integrate retrievals based on characteristics other than storage location –Chronology, content type, etc. 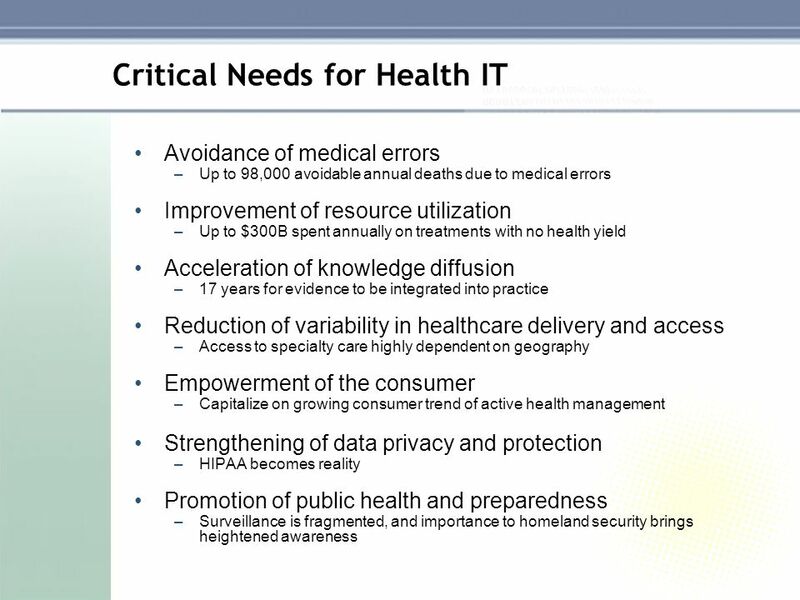 Download ppt "The U.S. Health Information Technology Agenda – and the Web John W. Loonsk, MD Director of Interoperability and Standards Office of the National Coordinator." NISTs Role in Securing Health Information AMA-IEEE Medical Technology Conference on Individualized Healthcare Kevin Stine, Information Security Specialist. Electronic Health Record Systems: What are They, Why have They Failed for so Long, and What Progress is Being Made Now? C. Peter Waegemann CEO, Medical. HIT Policy Committee Federal Health IT Strategic Plan April 13, 2011 Jodi Daniel, ONC Seth Pazinski, ONC. Community of Interest for Patient Identifiers AGENDA 1.NHII’s Unique Health Information Identification Requirements - Soloman I. Appavu, SIG Leader 2.Identification. 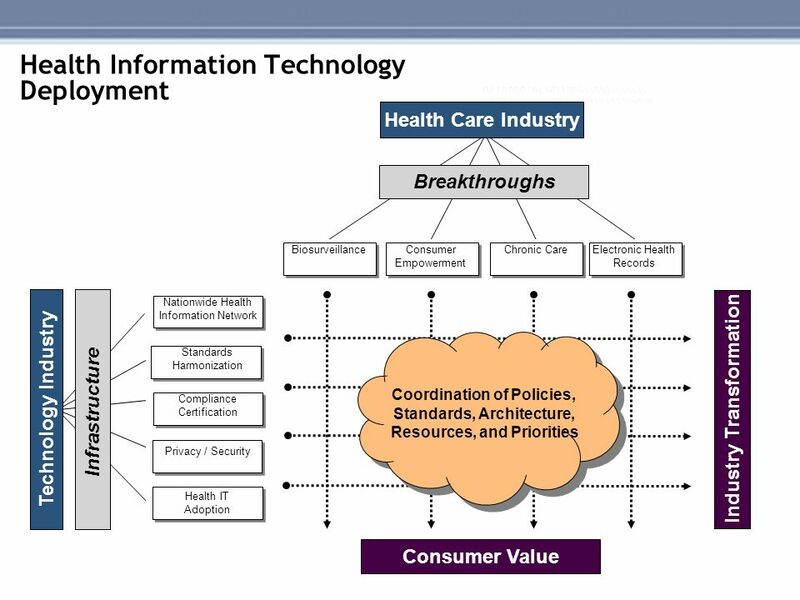 Health Information Technology Framework for Strategic Action U.S. Department of Health and Human Services Office of the National Coordinator for Health. 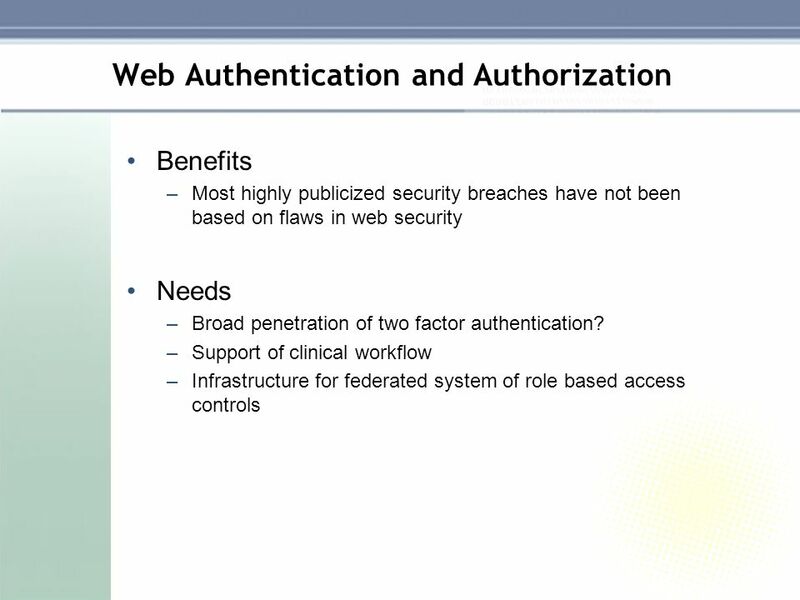 Westbrook Technologies from Document Management’s Role in HIPAA. 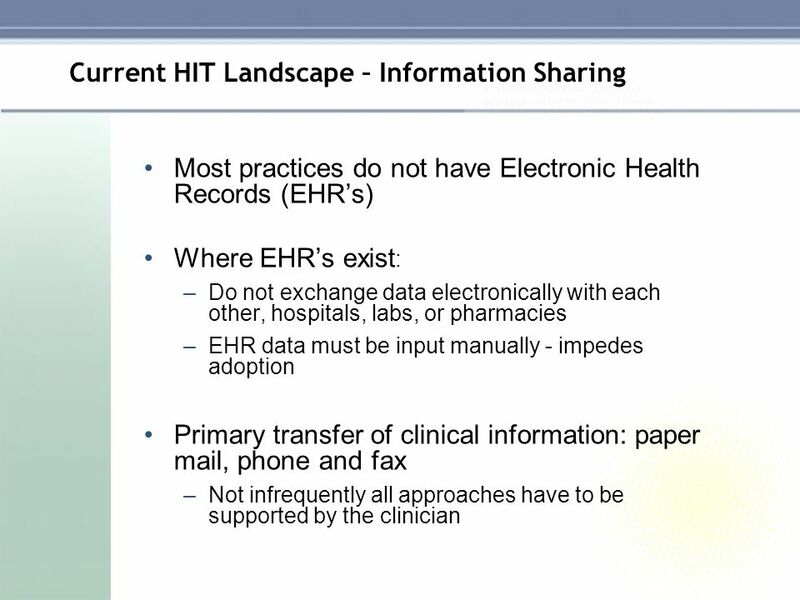 HITSP – enabling healthcare interoperability 1 enabling healthcare interoperability 1 Standards Harmonization HITSP’s efforts to address HIT-related provisions. 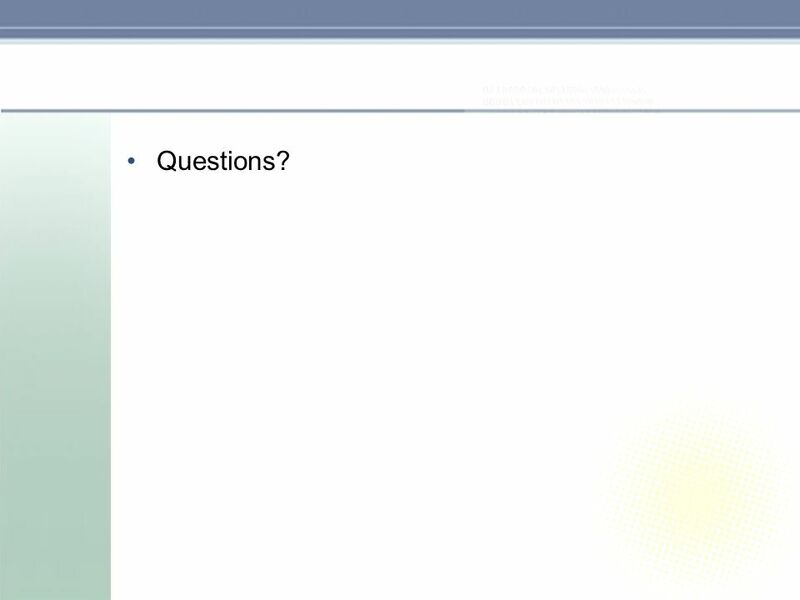 Copyright © 2009 by The McGraw-Hill Companies, Inc. All Rights Reserved. 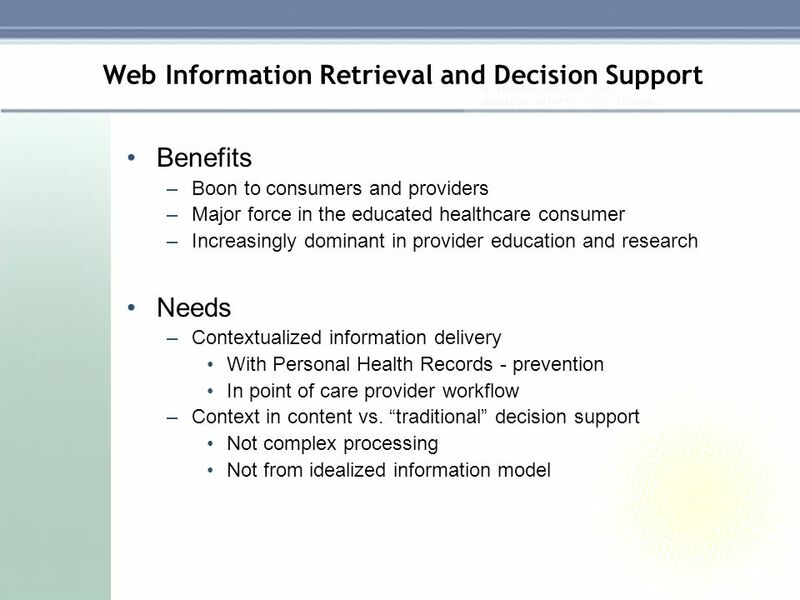 McGraw-Hill Chapter 1 Introduction to Electronic Health Records Electronic Health. Toward Healthcare Interoperability LeRoy Jones, Sr. Advisor Office of the National Coordinator for Health Information Technology.